Everything was fine. Breakfast was ok selection of a lot of diffrent Things. The rooms were clean and the bed was perfect. Thank you! Very relaxed, great breakfast, close to Cliffs of Mohr and the Doolin pubs which host amazing trad sessions. Glasha Meadows is a really nice B and B. Super nice room, large and very clean, and the nicest people ever who run the place. Breakfast was good, always tea/coffee and cookies out for guests. Lovely view across the street to field of cattle and horses. Short walk into town center. Very close to the Burren, Cliffs of Moher, Doolin Cave. Marion and her family are very warm and welcoming. This B&B was extremely clean and comfortable with a wonderful shower! The homemade breakfasts are more than plentiful, porridge was delicious! I would highly recommend it to all travelers. Thank you for your warm hospitality!! Stayed here as part of our honeymoon and were treated excellently! The staff is fantastic and the rooms were also great! Highly recommended!!!! We left a jacket in our room and they found it and mailed it back to us. Great service!! Marion and Martin made my experience in Ireland a very good one. Their B & B was lovely, breakfast excellent, and they took very good care of me, a solo traveler. Beautiful, very clean, delicious breakfast and very welcoming owners! Hope to stay again! Clean, welcoming, perfect in every way! Thank you! Would stay again without a doubt. Highly recommend staying here! Tosca and her husband are absolutely delightful! The pictures do not do this place justice. The rooms are beautiful and comfortable and breakfast was superb. By far the best thing about this place is the wonderful couple that run it. Thank you so much for such an enjoyable stay. We thoroughly enjoyed our stay at Glasha Meadows, our room was very comfortable and had everything we could possibly need. Breakfast was delicious and delivered at our requested time. We felt very welcome and comfortable from the second we arrived and would recommend Glasha Meadows to everybody! My wife and I stayed at Glasha Meadows on a June/July 2016 trip which was the celebration of our 40th anniversary and the morning we left was my 64th birthday! I was very happy to start my 64th year with a hot coffee sitting out in the driveway listening to the livestock in the distance while enjoying the sunrise. We were very satisfied with out accommodation and the breakfast in the morning before our departure, it was only one night but a lovely stay. We found everything to be clean and in good order. The evening before we stayed up in the lounge with the other couple we were traveling with and it was like being in our own living room for comfort and hospitality, I wish we had thought to ask Marion and Sandra to join us. This B&B is out in the countryside a little so you do need a car but we did have a good driver/guide who did not mind taking us to Doolin for supper. I definitely recommend this lodging. As our reservation was by a third party I could not rate communication but assume it to be no less than a good. Sandra, the celebratory Baby Guinness we had in Birr was delicious thank you. After 35 years of managing high end hotels and resorts i am very happy to report that GLASHA MEADOWS is a top of the line B&B. the accommodations are up there with the best. Service and food is the same. Marion and Sandra are most gracious hostess. If we ever return to Doolin, Ireland this is where we will stay. The Extra service we received was in first class order. Comfortable, clean and very welcoming. We enjoyed our stay and would definately recommend it. comfortable rooms, lovely bathrooms, welcoming hosts and beautiful scenery. I would love to stay there again. 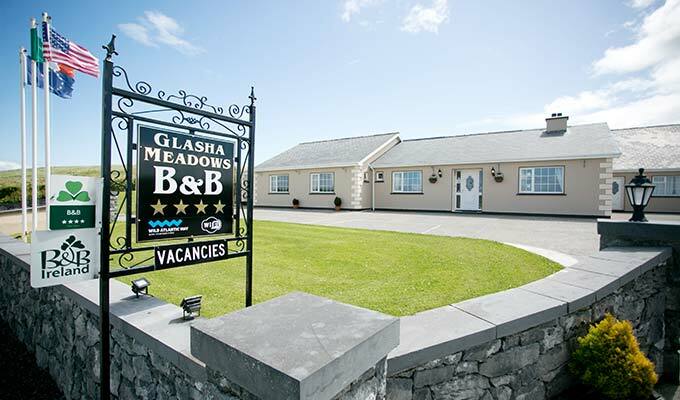 Glasha Meadows is an extremely clean and well furnished B&B. I would highly recommend it to any travelers. The breakfast made by the owner was delicious and plentiful! There was something for everyone regardless of likes and dislikes. The owner was so kind and helpful. My only comment not a good or bad thing is that this B&B is a little bit up the road from the "downtown" Doolin area. about a 2 or 3 minute drive, but you can't walk in the dark. But it is extremely close, and it is in an absolutely gorgeous area. We could not have been made more welcome. Nothing was too much trouble. Excellent food and facilities, a most enjoyable stay making our first visit to Ireland a great success. Wonderful accommodations and wonderful ownership. Marian and Martin made our first night in Ireland memorable. As many noted....quite possibly the most comfortable beds in our whole 2 week stay in Ireland! Very comfortable stay. Marian was quite welcoming. I enjoyed it very much. Lovely B&B in a beautiful setting. It was my third time here. The hosts are very welcoming and helpful and always up for a little chat. Ideal for touring the Burren and see the Cliffs of Moher. Great breakfast and nice rooms. Would come back anytime. Thanks for everything! Loved this place. Great rooms. Mary is amazing! Could not fault this B & B in any way. First class . Nice place Glasha Meadows, friendly people. I give it 7 of 10. Very good breakfast! great and unforgettable stay. we suggest it to everyone who want to discover real people of ireland, magic isle. we will never forget the kindness of Marian and her fantastic breakfast!!! if one day we'll back in ireland, sure to choose this incredible place.